One of the biggest advantages of owning an RV is that you can enjoy the life outdoors with friends while staying comfortable when you’re on the move, and when you’re ready for bed after a long drive. A class C motorhome will be especially fantastic in this regard as they’re cost-effective, spacious,and generally feature a ton of amenities that will make your camping experience a memorable one. 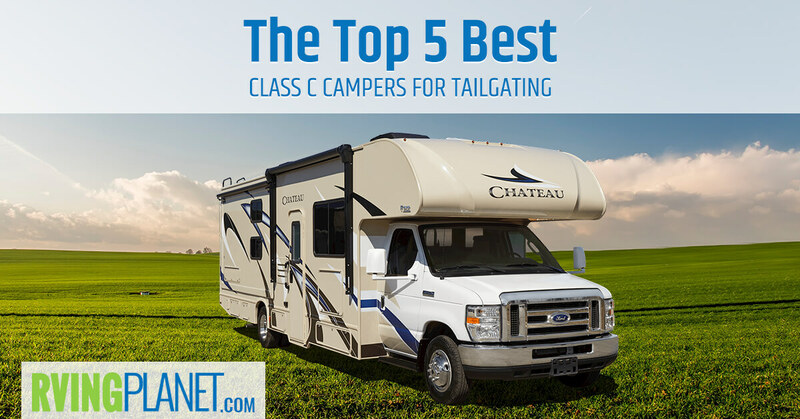 With that in mind, let’s take a look at the top 5 best class C campers for tailgating. What puts an RV on the list: There are a lot of class C campers out there, but we’ve cherry picked the ones that feature particular exterior items and tailgating features such as outdoor kitchens, exterior TV connections, and outdoor entertainment. 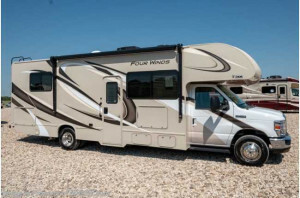 View All Thor Chateau Class C Motorhome Floorplans! 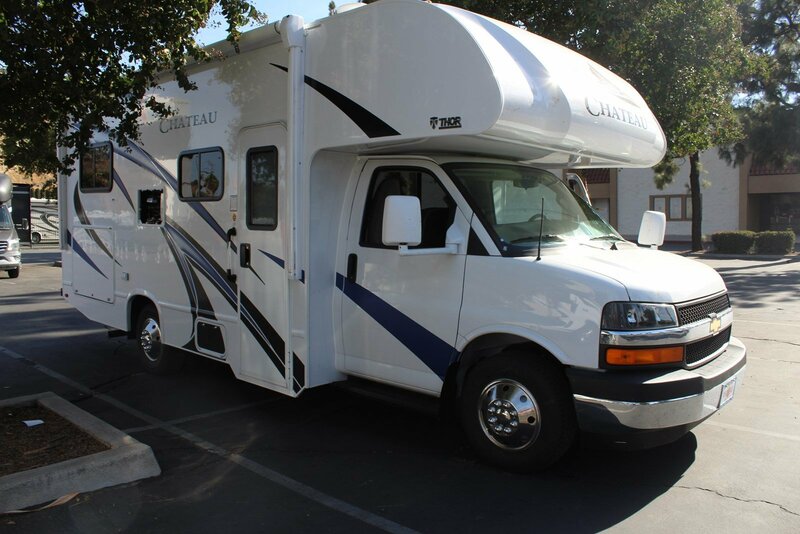 Why we recommend the Thor Chateau Class C Motorhome: The Chateau is probably the most popular class C on our website and even on other forums and websites in the RVing world. A large part of its popularity is due to the fact that it is versatile and provides buyers like you with a large number of floorplans that sport unique layouts, sweetening the deal even further. We recommend taking a look at the Chateau 29G floorplan. Although the 29G is the only floorplan with an outdoor kitchen, it has other tailgating features that are quite useful, as well. We particularly liked the outdoor swivel TV expansion and the decently sized awning that will give you coverage when it’s too hot, or too rainy. 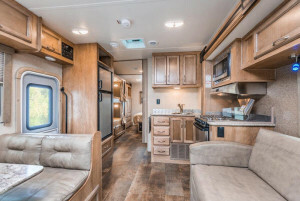 Other convenience – based features include a blu-ray player in the living area, 16 cubic feet double door refrigerator, a leatherette dinette booth, and much more! 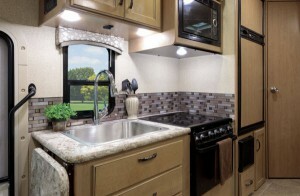 View All Coachmen Freelander Class C Motorhome Floorplans! Why we recommend Coachmen Freelander Class C Motorhome: With a solid 4.5 star rating, one would find it hard to not to include the Freelander in the list of class C campers for tailgating. Well, that and the Freelander 20CB plus Freelander 21RS floorplans that have great outdoor kitchens and outdoor entertainment features. 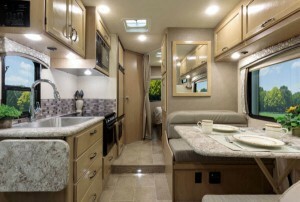 There are quite a few floorplans like these, so if you prefer choosing between an array of options, the Freelander is a good RV to consider. In terms of features, we really liked that the Freelander has a Wi-Fi ranger, which is perfect for those days when you want to catch up on social media or finish up a bit of work before you go on your camping adventures. The safety features include extinguishers and alarms, and a few additions such as a safety child tether at forward facing dinettes. 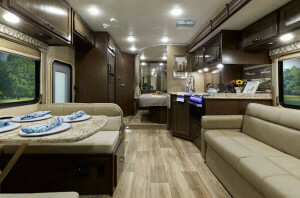 You do get a variety of additional expansions and upgrades which include but are not limited to an exterior TV, driver swivel seat, black slide out awnings, and a cockpit folding table. 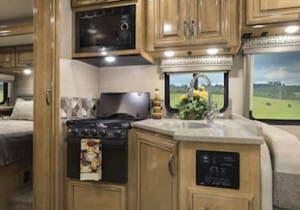 A Window Into What Makes a Perfect Motorhome! View All Gulf Stream Conquest Class C Motorhome Floorplans! 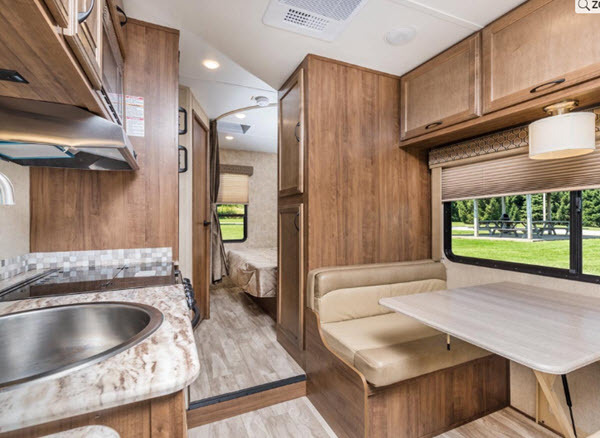 Why we recommend Gulf Stream Conquest Class C Motorhome: If you are willing to tailgate without an outdoor kitchen on the Conquest C 6314 floorplan, we highly recommend going for the Conquest C 6320 floorplan. 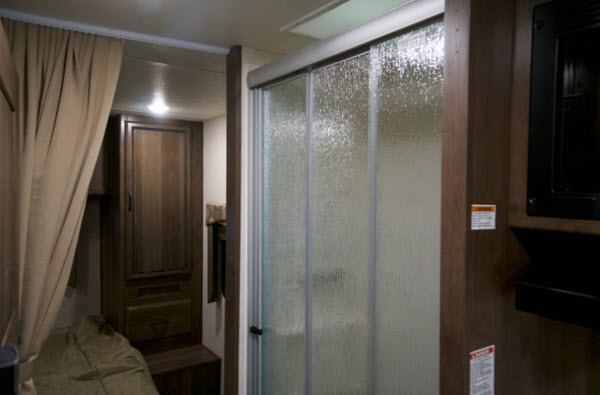 it has a 32 feet footprint, which can sleep 8 people due to the inclusion of both a bunkhouse and bunk over cab. This makes it a great space for all of your friends and family! 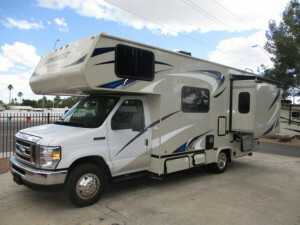 Depending on the floorplan, each has a slightly different variant of the specs, such as Ford 450 engine on some floorplans and a Ford 350 variant on others. 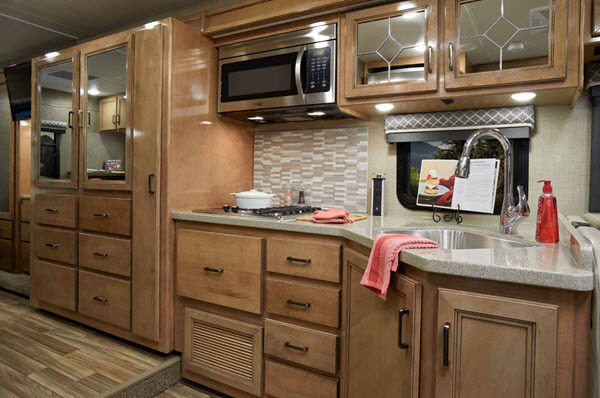 However, a lot of features are similar throughout, such as basement storage, light cherry cabinetry, upgraded interior fabrics, dash A/C and pleated window shades. 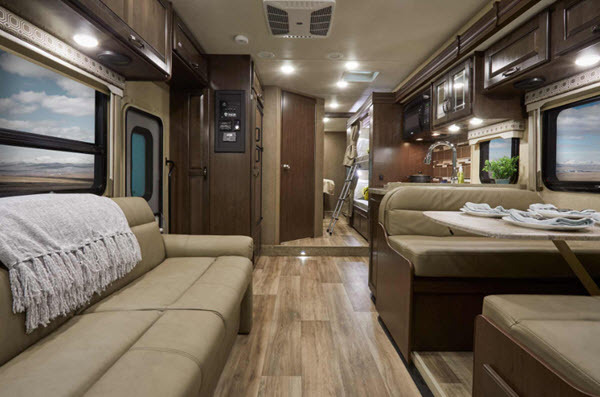 A luxury package is also included with this RV, which that adds quite a respectable number of quality features, such as the electric awning and the 13,500 ducted roof A/C. The Heavy-Duty Tailgator’s Dream Camper! Why we recommend the Thor Four Winds Class C Motorhome: A classic in the motorhome industry, the Thor Four Winds is an excellent class C camper for tailgating as it takes a step further from the Freelander by having a mind boggling 17 floorplans that either have a dedicated outdoor kitchen or outdoor entertainment features. We recommend taking a look at the Four Winds 22B and the Four Winds 28E. When it comes to features, the Thor Winds is as good as class Cs get, showing the attention to detail that Thor has always put on their RVs. From the heated remote exterior mirrors to the leatherette Captain’s chairs, they’ve covered it all. For those wanting even more luxury out of their RV, it has a myriad of options available; a list so long that we suggest taking a look by clicking on the link above to check it out yourself! Why we recommend the Thor Quantum Class C Motorhome: At this point in time it may seem odd to include a Third Thor motorhome in the mix. 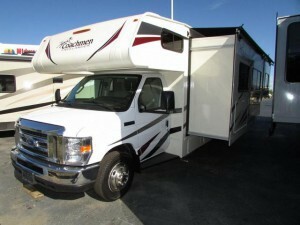 However, we’ve found this motorhome to have great ratings and a number of features that we know you’ll love. 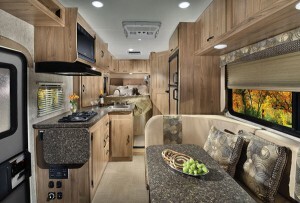 We recommend checking out the Quantum RW28 and the Quantum WS31 Floorplans. 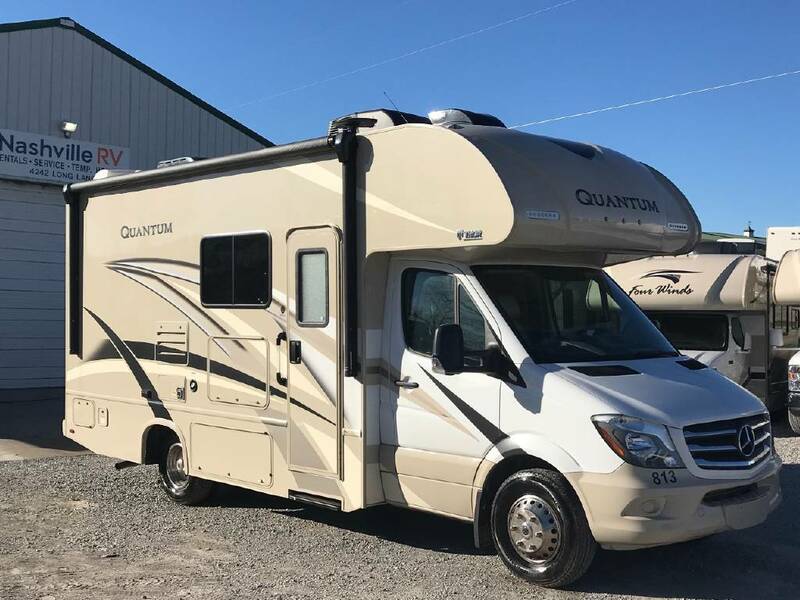 Looking at the features, you’ll find that the Quantum has all the typical features of a Thor motorhome with a few others mixed in. Mentioning a cup holder may seem like a small thing, but driving with a cup holder is more convenient and makes for a smoother drive. It’s these little things that the Quantum excels at to make your experience truly good. You’ll find no shortage of optional features and expansions with the Quantum, but we specifically recommend taking a look at their Platinum and Diamond package, as both add a slew of really useful features for an RVer. The Thor Quantum is a solid choice for those looking for class C campers for tailgating. Share with us your favorite class C campers for tailgating in the comments below!